Learning, growing, teaching, coaching, playing, and helping others to do the same. DataVolley and statistics nerd. Training others to be the same. There are many books that have been written by sports and business figures that sit somewhere between teaching tool and autobiography and Josh Waitzkin's The Art of Learning is one such book. I had wanted to read this book for some time mainly because of Waitzkin's name recognition and a couple of positive comments from friends. Most books of a hybrid type like this that I have read are written by coaches and are intended to show how that coach has made others into champions. 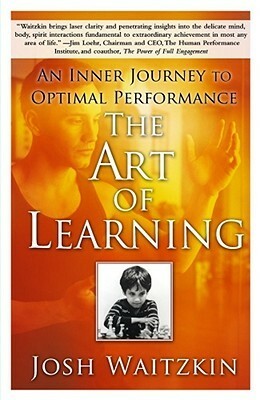 This is the first book I can recall that is written by the learner rather than the teacher. While Waitzkin had teachers and mentions many of them, this book is far less about them and far more about how Waitzkin absorbed their ideas as well as those of others, added his own ideas, and melded everything into philosophies that were maybe not uniquely his but certainly uniquely tuned to him and his personality. He has been described as the "metalearner's metalearner" by Tim Ferriss and this book is a clear demonstration of why. Waitzkin gives insight after insight of how he learned and what he learned about how he learned. As with many similar books, the lessons are interleaved with stories that are in a consistent timeline that builds toward a culminating event that showcases the lessons learned along the way. The first section, "The Foundation", establishes that Waitzkin cares deeply about his identity and sees it as central to not only his story but also to much of what he has learned. He crystallizes this lesson in the chapter "Breaking Stallions" by telling a story about "taking away our natural voice [to] leave ourselves without a center of gravity to balance us as we navigate the countless obstacles along our way". As a teacher, I see this as an important reminder that I can embrace my learner's natural voice and show them how to enhance that voice to reach higher levels of learning and performance. The second section, "My Second Art", transitions from chess to martial arts, which was clearly the focus that led to writing the book (2007). 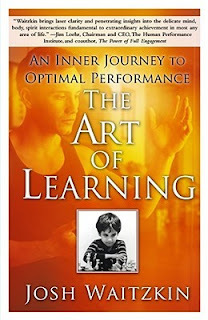 He uses the experience of starting again as a novice to show the value of a beginner's mind as well as to explain the benefits of truly internalizing his learning. This internalizing appears to be a deeper level of unconscious competence, as he tells of how this deep understanding of his craft led to valuable insights that allowed him to continue growing in ways that were virtually unnoticeable to the untrained eye. Something that I missed in this section until I looked back on it later is the amount of time that is required to internalize, reflect, and learn in this way. While I still see a great deal of value in this section, I feel like it took me many more years to reach the same level of understanding and development in my craft than it took Waitzkin because of the amount of deliberate practice that each of us could spend. It was so easy to overlook the amount of time it takes to achieve such deep understanding. I am not opposed to taking that amount of time but I think it is important to note that, if I wanted to implement some of the ideas in this section to a new craft, I could probably put the book down for a few years before moving on to the last section. This last section is called "Bringing it All Together" and it is here that Waitzkin writes about how he moved his learning from theory and practice into competition. This section gives him the chance to finish his story by explaining how he took all he had learned about learning and applied it successfully in a world championship setting. 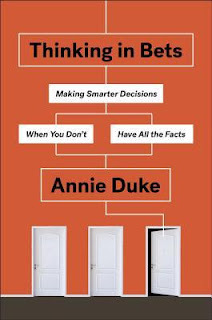 In sum, I found this book to be an interesting and informative read but I did not find that it broke new ground for me in my personal development or understanding. I think that it is a good book that can provide not only an engaging narrative but also light fires in almost any learner. Thanks for the review,I thinknI can take this one off my "all too long list" of need to read. Words About Numbers - How Do We Make Them Matter? Copyright Eduardo Fiallos. Travel theme. Powered by Blogger.